I first made these tacos while we were staying with some friends. We don’t get to see them often and I honestly didn’t know what they liked to eat, but wanted to surprise them with dinner after work. I saw several bottles of honey mustard in their refrigerator and decided to make something that would go with that flavor. Thus the slaw was born, and the BBQ tacos soon followed to make a full meal. I think it’s a super fun combination. It also has the benefit of being fairly nutritious and tasting naughty; perfect for Father’s Day. Add olive oil, swirl to coat the bottom, and add the tofu in a single layer. Cook until the first side of the tofu is golden brown, and it easily comes off the pan to be flipped. If you have to scrape at it, just let it cook a little longer. Flip/stir tofu and continue to cook until most sides are golden brown. Remove the pan from the heat and add the tamari stirring to coat the tofu. Add BBQ sauce and stir again to coat tofu. 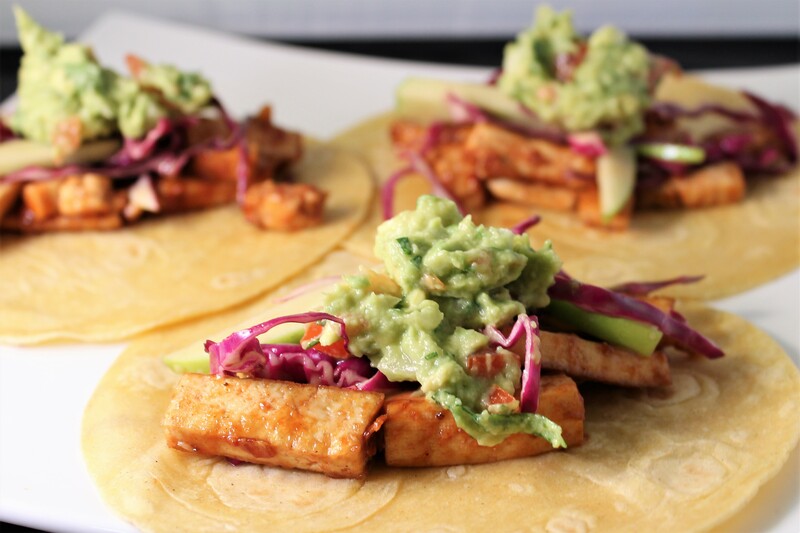 Divide tofu evenly between warmed tortillas, top with cabbage slaw and guacamole if using. Soft tacos are a perfect vessel for deliciousness!